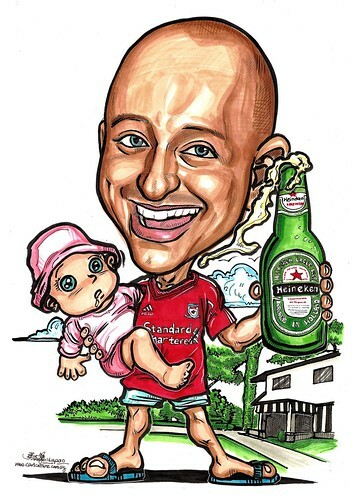 You did a great caricature for me a couple of years ago for a 40 th birthday. it alos had a frame and an inscription. see the mail below for the history. i would like to get another one don now for a different friends 40th birthday. the print you did last time was for a 40th birthday. it was a single guy on a beach wearing a man u shot with a bottle of champagne, and a golf club. I am looking for A3 size with the same frame as last time. I would also like a high resolution scan if possible"
Very rush job. Got to give allowance for inscription and framing. If you are interested on how I colour the face, I have more detailed demonstrations on my Facebook Page.